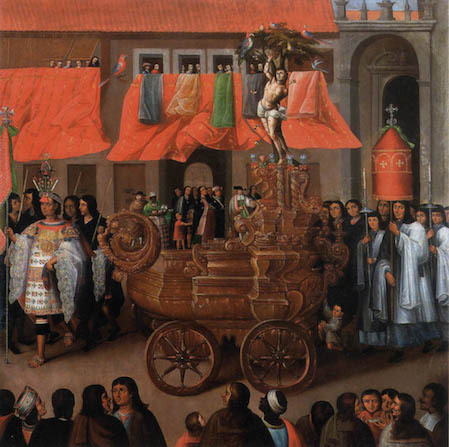 Inka, Spanish, and Christian traditions come together in this 17th century painting of a religious procession in Cusco (in present day Peru). At the time, much of South America was a Spanish colony governed as a viceroyalty (a viceroy was someone who ruled as a representative of a monarch—in this case, the King of Spain). Cusco was part of the Spanish viceroyalty of Peru which lasted from the 16th to the 19th century. To make matters more complicated, Cusco was also the former capital of the Inka Empire. Parish of San Sebastián is part of a series of eighteen canvases (sixteen of which survive) that depict the religious festival of Corpus Christi in Cusco. These large paintings (they range from 6 feet square to 7 x 12 feet) were painted by at least two artists and were made for the Santa Ana parish church in Cusco, located in the Andes mountains. Corpus Christi, meaning “body of Christ” in Latin, is a celebration of the Catholic doctrine of transubstantiation—the transformation of the wine and bread of the Eucharist into the actual blood and body of Christ. The religious processions that accompany this festival have been compared to ancient Roman triumphs, which generally celebrated military victories. The triumphal Corpus Christi processions celebrate Christ as victor and metaphorically allude to the triumph of Christianity over pagan religions (the Corpus Christi festival is still celebrated in Cusco today). In the painting, we see the Eucharistic host (the sacramental bread) along with a statue of a saint, paraded along a processional path. A bishop on the far right (see image left) carries a monstrance containing the Eucharistic host (a monstrance is a vessel used to display the host). In addition to the bishop, other members of the San Sebastián parish community—including clergy members, government officials, and leaders of the indigenous Inka population—were included in the procession, while elite citizens of Cusco witness the procession from their windows. This annual triumphal procession signaled the dominance of Spanish colonizers over the indigenous population. Conveniently, Corpus Christi coincided with the Inka solstice celebration of Inti Raymi, or “Festival of the Sun,” leading to conflation of these festivities and aiding Christian conversion efforts. In addition to the figures, we see a processional cart in the center, on top of which appears a statue of Saint Sebastian. These carts appear throughout the series and were based on structures used for religious processions in Spain celebrating the festival of Our Lady of the Immaculate Conception. The carts resemble ships’ hulls and are modified from illustrations the artists in Cusco saw in a Spanish festival book (left). In this case, Saint Sebastian, who appears tied to a tree and pierced with arrows to represent his martyrdom, has replaced the Virgin Mary. Leading the procession is an Inka kuraka who acts as a standard bearer (see bottom image). Also referred to as caciques, these local rulers of indigenous descent were granted privileges (cacicazgos) by the Spaniards and allowed to maintain a position of leadership after the Spanish conquest in the Andes. By the early-seventeenth century, twenty-four caciques held this hereditary office—making this an exclusive position. In exchange for their acculturation and adoption into the Spanish hierarchy, caciques were required to implement Spanish law among the indigenous population. To maintain their status, it was necessary for caciques to prove their indigenous heritage. Caciques were often the subject of portraits that sought to authenticate their sitters’ political position. These images derive from traditional Spanish portraiture (the visual representation of rulers was not an established tradition in Inka culture). 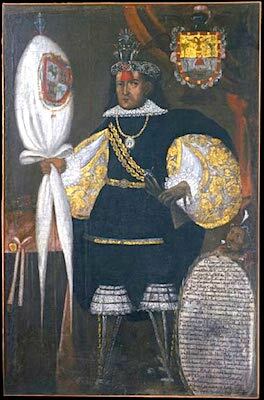 Cacique portraits, such as the Portrait of Don Marcos Chiguan Topa, included panels of text that referenced the subjects’ indigenous heritage. Additionally, elements of traditional Inka costumes were often employed to emphasize the caciques’ Indian-ness and therefore validate their positions as kurakakuna. Caciques were sometimes depicted wearing tunics that evoke indigenous textiles through their intricate designs, as well as crowns that included a mascapaycha, a red-colored fringe that covered the forehead that was traditionally a symbol of Inka royalty. It was traditionally worn on the crown of the Sapa Inka (or “unique Inka,” the preeminent ruler during pre-Hispanic times). Breeches and long sleeves with lace were often added as traditional Spanish elements. The cacique depicted leading the procession in the Parish of San Sebastián canvas wears an Inka tunic (uncu) with modifications to incorporate Spanish costume elements, like lace sleeves. The highly detailed garment, which includes a sun face on the front, is meant to indicate Andean nobility. The cacique’s crown also features a mascapaycha to distinguish his status. The crowns of the caciques depicted in the series were accompanied by other details such as feathers, flowers, birds, and rainbows. 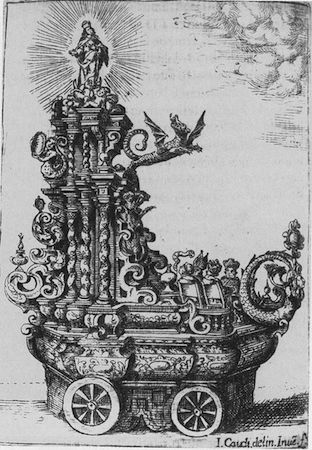 This particular mascapaycha in Parish of San Sebastian features a rainbow topped with a silver globe with feathers and banners, as well as two curiquenque birds, all typical of pre-Hispanic Inka noble insignia. The mascapaycha as an emblem of Inka royalty was adopted by caciques during the colonial period to reference their descent from previous Inka rulers and imply their legitimate status. This detail marks the cacique as an Inka elite, yet acts as a sign of difference between this indigenous figure and his Spanish colonizer to whom he is subjected. 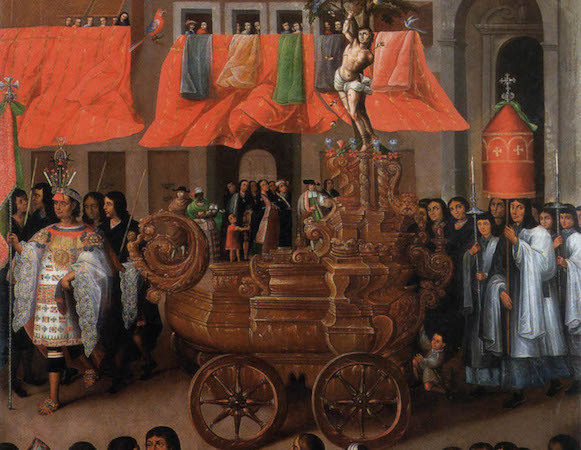 Through participation in these Corpus Christi processions, caciques were able to bear the emblems of their indigenous heritage while proclaiming their loyalty to the Spanish state. In the foreground of the painting we see fourteen people of diverse ethnicities, alluding to the heterogeneity among the population of Cuzco. While the procession’s standard-bearer wears regalia indicating his pre-Hispanic roots and political status, the figures in the foreground do not appear in Inkaic costume. These citizens seem distanced from the elite cacique who actively participates in the festivity because of their lack of status symbols, as well as their cropped appearance at the bottom of the composition. Because of this distinction in social status, the onlookers at the bottom of the canvas, along with the viewers outside the canvas, participate only indirectly in this procession. The participation of caciques in Christian festivities like Corpus Christi may be read as a performance of their “otherness” as distinct from their Spanish colonizers. This performance aided in converting the indigenous populations to Catholicism and strengthening Spanish control. By wearing the mascapaycha and other traditional costume details, these Inka elites embody the pre-Hispanic rulers from whom they claim to descend. This depiction of indigenous performance in a European, Christian festivity draws attention to the conflation of Inka and Christian traditions that may allude to both a celebration of indigenous heritage as well as subordination to Spanish dominance. Thomas B. F. Cummins, “We Are the Other: Peruvian Portraits of Colonial Kurakakuna,” in Transatlantic Encounters: Europeans and Andeans in the Sixteenth Century, ed. Kenneth J. Andrien and Rolena Adorno (Berkeley: University of California Press, 1991), pp. 203-231. Carolyn Dean, Inka Bodies and the Body of Christ: Corpus Christi in Colonial Cuzco, Peru (Durham, NC: Duke University Press, 1999). Cite this page as: Caroline Gillaspie, "Parish of San Sebastián, Procession of Corpus Christi series," in Smarthistory, August 9, 2015, accessed April 22, 2019, https://smarthistory.org/parish-of-san-sebastian-procession-of-corpus-christi/.